HOW MANY/HOW MUCH: Limited to 500 pieces @ US$100.00 each (Free Worldwide Shipping). 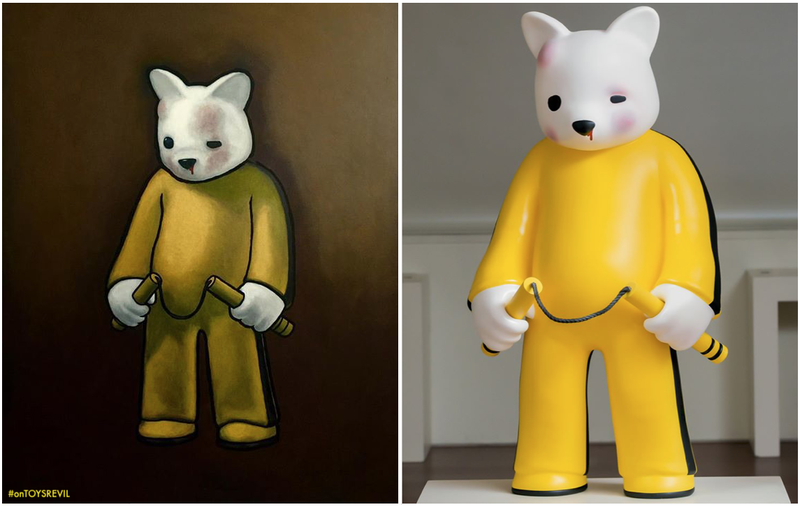 #toynews featured #onTOYSREVIL: http://bit.ly/2FWW7ZC = "BRUISED LEE" OG Edition by #LukeChueh x #VTSSToys available to order now on www.vtsstoys.com. #vinyltoy limited to 500pcs @ US$100 each. REMARKS: Sized 6.3 inches tall, "Bruised Lee" is artist Luke Chueh's first vinyl figure with VTSS. Each figure comes with a pair of nunchuck, head and arms both are rotatable. Combining Luke's "iconic" bear design and Bruce Lee's classic yellow jumpsuit from movie "The Game of Death", the shipping date is scheduled for 2018, April 16th. The first incarnation of this toy-release was a painting from Luke, then most recently a 4 feet tall fibreglass sculpture titled "It Takes More Than A Jumpsuit"! This toy-is the "Unbruised" Edition.